Sometimes you just get a feeling about a book. 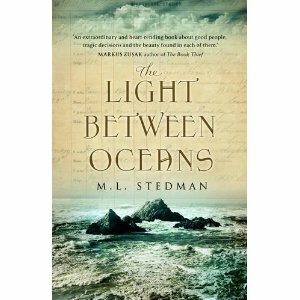 As I mentioned in a recent post Book Titles – (Don’t) Call It What You Like, I wanted to read The Light Between Oceans from the moment I heard the title: it is original, it conveys the theme and gives a real taste of the beauty and emotion of the story inside the (equally beautiful) cover. I’ve just told a group of friends about this book, one of at least ten conversations since I finished it last week. That’s just me; multiply that by all the people who already love it two weeks after publication and you have PR gold dust; nothing works like word of mouth. (See Being Selective – How do you choose which books to read?) It’s free, it can’t be manipulated and there’s always something behind it. There has never been a worse time to try to get a novel traditionally published, but M L Stedman’s debut was sold at a 9-way publisher auction in the UK and the international rights in 17 territories. I’ve heard it said many times that however tough the climate, the best novels always rise to the top and the fact that this one was snapped up is proof of that. Every novel needs a ‘hook,’ an enticing and ideally unique premise that can be summed up in a few words, and the author was onto a winner with this one. Tom Sherbourne has survived the First World War physically unscathed and is working as the keeper of a lighthouse on Janus Rock, a tiny remote island off the coast of Western Australia at the meeting point of the two oceans of the title (Indian and Great Southern). Falling in love with his young wife Isabel on his return home has brought him happiness he never imagined possible. She willingly leaves her parents and home in the small port of Partageuse to join him in blissful isolation on the island, their only contact with the mainland a delivery of supplies by boat every three months. The gaps between visits back to shore are measured in years. The Light Between Oceans has an arresting opening. It is 1926. A boat washes up on shore, its cargo a dead man and a crying baby. Until now, a child is the only thing missing in Tom and Isabel’s life, a huge source of sadness and loss to her. Without other people to interfere or judge them, Isabel can only contemplate one future for the baby. For Tom, it is the start of a long struggle with his misgivings about the decision they make. The book is written in three parts, in the third person through the eyes of the main characters, but with Tom at the centre. After the arrival of the boat, the narrative cuts back to 1918 when he returns from the War, mindful of those who did not, and those who returned broken. When shortly after meeting Isabel, he takes up his post as lightkeeper on Janus Rock, he finds an unfamiliar peace in this wild and lonely place which the author evokes so vividly. On clear summer days, Janus seems to stretch right up to its tiptoes; you’d swear it’s higher out of the water at some times than at others, not just because of the rising and ebbing of the tide. […] From the [lighthouse] gallery, the horizon stretches forty miles. It seems improbable to Tom that such endless space could exist in the same lifetime as the ground that was fought over a foot at a time only a handful of years ago, where men lost their lives for the sake of labelling a few muddy yards as ‘ours’ instead of ‘theirs’. At the heart of this novel is a compelling human story and a complex moral dilemma, and it’s not difficult to guess what that is. The Sherbournes cannot avoid the mainland completely and a trip back to Partageuse to celebrate the 40th anniversary of the lighthouse on Janus Rock changes everything. Novelists often seem to direct the reader to react to the characters in a certain way, to sympathise or to judge, and I really didn’t feel that here; instead I sensed that this was written with great compassion. All of the main characters are good people in an impossible situation; happiness at someone else’s expense is both fragile and dangerous. This is superb storytelling which finds expression in beautiful language. I have rarely read anything which made me feel so completely engaged and torn, and even fewer books have made me cry like this did; I can’t think about it without getting a lump in my throat. [Tom] turned his attention to the rotation of the beam, and gave a bitter laugh at the thought that the dip of the light meant that the island itself was always left in darkness. A lighthouse is for others; powerless to illuminate the space closest to it. every man is a piece of the continent; a part of the main. For something completely differerent but still on the lighthouse theme, see Book Review – The Lighthouse by Alison Moore one of the 12 titles on the Man Booker Prize 2012 longlist. Cannot get it here until August..dang..nor can I download the e book from Amazon UK..ah well,it is on my list. Your review was irresistible. How frustrating (don’t get why the e-book can’t be available all over?) but I promise you, it’ll be worth the wait! Sounds awesome! What a compelling review. I bet people’d pay you to write these things. 🙂 Can’t wait to see your top 10 summer reads. Thanks Erin. Sadly nobody does pay me but at least that means I can be unbiased about the books I think are worth reviewing and recommending. You had me at the title! Can’t wait to read it. I don’t always enjoy when the author tells the story through different characters’ perspectives, but this one sounds promising! Hi Emily, this is one of those books where I envy anyone who hasn’t yet read it (I can re-read, but it wouldn’t be the same) – I hope you enjoy it. I was interested in your comment re multiple viewpoints – I’m the opposite and love getting different characters’ take on what’s happening – it’s certainly very important in this book. I loved this book. I read it in three days. You’re right when you say that the author writes with great compassion. And this book also made me cry! She truly is a talented storyteller. I can’t wait to read her next book. Thanks for sharing your response to the novel, Jane. I am completely in awe of Margot Stedman’s talent and like you I keenly await her next novel. I really enjoyed this one, too, but agree with you about that final chapter–I much preferred the ambiguity that would have been afforded had the book ended earlier. The ambiguity and ambivalence so inherent in this book was what made is such a good read for me. Ah, epilogues–the great killer of endings!